This card consisted of three championship matches, plus two single matches. 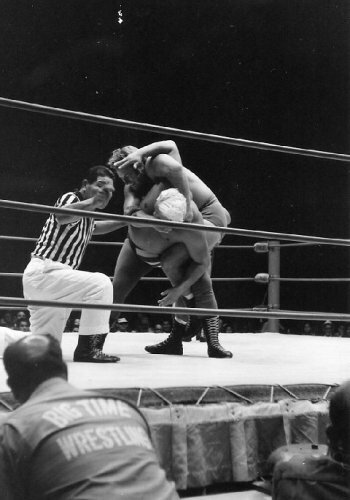 In the first event, Peter maivia defeated Dave Ruhl. Rocky Montero went to a draw with Ray Kamaka. In the World Tag Team match, Don Leo Jonathan and Pedro Morales (who took the place of an injured Tex McKenzie) defeated the team of Kenji Shibuya and Mr. Saito after they were disqualified for throwing salt in Morales' face. However, Shibuya and Saito retained their World Tag Team championship since the title can't change hands on a disqualification. In the match for the Hawaiian Tag Team championship. Nick Bockwinkel and Bobby Shane defended their titles against Ripper Collins and his new partner Killer Buddy Austin. In the first fall, Collins gave Shane an Atomic Drop then dragged him over to his corner where partner Austin did a bombs away on to Shane from the top ropes. The first fall was in the time of 10:11. Wally Tsutsumi pat down and give instuctions to both teams prior to the start of the match. Bockwinkel and Shane double team Ripper Collins. Nick Bockwinkel applies the abdominal stretch on Collins to win the second fall. Iaukea gives Kiniski "The Big Splash." Nick Bockwinkel used the Abdominal Stretch on Collins to even up the match in 5:22. For the third and deciding fall, Friday Allman, acting as Collins and Austin's valet, used a cane to hit Shane in the back of the head when the referee wasn't looking. As a result, Shane fell to the mat and Collins pinned him to win the match. Killer Buddy Austin and Ripper Collins were then declared the new Hawaiian Tag Team Champions. The main event was for the North American Championship with Gene Kiniski, the champion, defending his title against Curtis Iaukea. The special referee for this match was Sandor Kovacs. The first fall went to Iaukea, who used The Big Splash and a pin in 4:42. The second fall went to Kiniski, who pinned Iaukea in the time of 10:37. 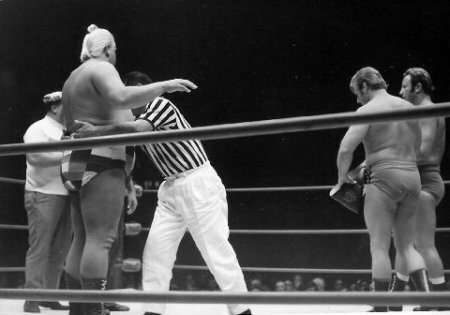 For the third fall, Iaukea threw Kiniski outside the ring and rammed his head into the time keeper's table at ringside. 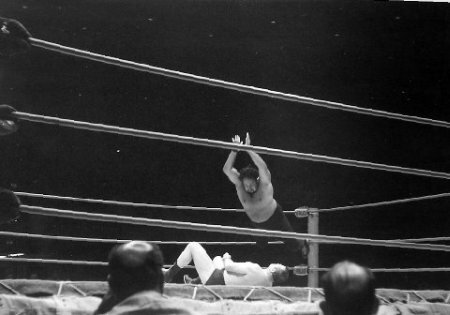 While the two wrestlers did their best to destroy each other, referee Kovacs counted both men out and the match was declared a no-contest. As a result, Kiniski retained his title.